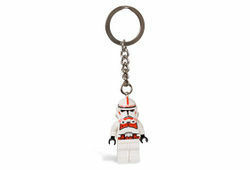 852347 Shock Trooper Key Chain is a key chain of a Shock Trooper, released in 2008 as part of the LEGO Star Wars line. This is a description taken from LEGO.com. Please do not modify it. (visit this item's product page) The power of the Empire guards your keys! Protect your keys with the Emperor’s personal squad of shock troopers! This sturdy metal keychain features an authentic LEGO® Star Wars™ minifigure and plenty of fun! Facts about "852347 Shock Trooper Key Chain"
The power of the Empire guards your keys!